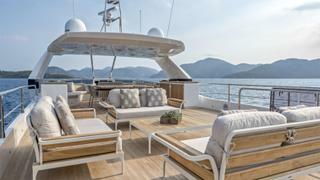 Turkish shipyard Numarine has revealed new photos of the second 26XP expedition yacht that was delivered in July. The full displacement yacht, which is currently receiving her world debut at the Cannes Yachting Festival, followed the delivery of Gioia, the first hull in the series, earlier this year. The 26 metre expedition yacht is equipped with an efficient full displacement hull and bulbous bow for maximised stability and long range. Veteran Numarine designer Can Yalman was handed the exterior and interior styling briefs while Umberto Tagliavini handled the naval architecture. 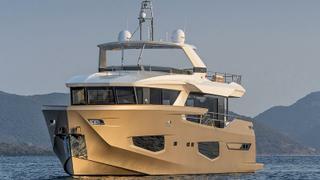 Numarine described the yacht as “modern, even futuristic” due to its angular windows and vertical bow. The model is based on the larger 32XP which was launched last summer but with a smaller draft that enabled her to enter shallower harbours. 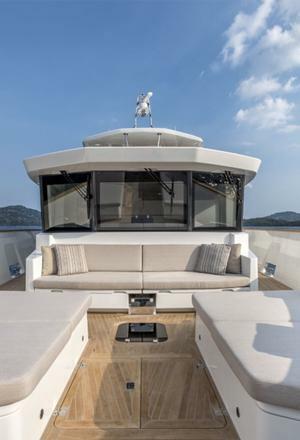 One key feature of the 26XP is a 16 metre flybridge which covers two thirds of the hull’s length and is big enough to provide storage space for a 5.5 metre tender. A second console unit and dining area partially enclosed by the radar mast are located forward while an open sun lounge sits at the stern. 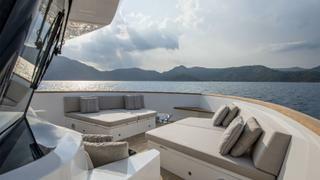 The yacht is equipped with a number of al fresco relaxation areas including an open dining area with oversized sunpad located aft and beach platform on the lower deck. The model can be built with either a semi-planing or displacement hull. Accommodation is for up to eight guests split across four lower deck staterooms, including an amidships master suite, two VIP cabins and a twin cabin. The crew quarters allows for a staff of up to three people. 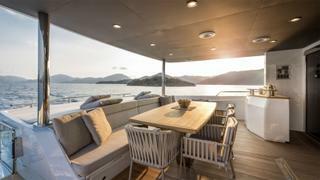 The yacht has numerous social areas including an extensive main saloon with full height windows. The saloon includes a lounge while an internal dining area sits adjacent to the galley. Power comes from a pair of MAN 560hp for a top speed of 13.5 knots and cruising speed of nine knots. Efforts have also been made to reduce all levels of noise and vibration on board. According to Numarine, the noise level in the owner’s cabin is 55dB at cruising speed.